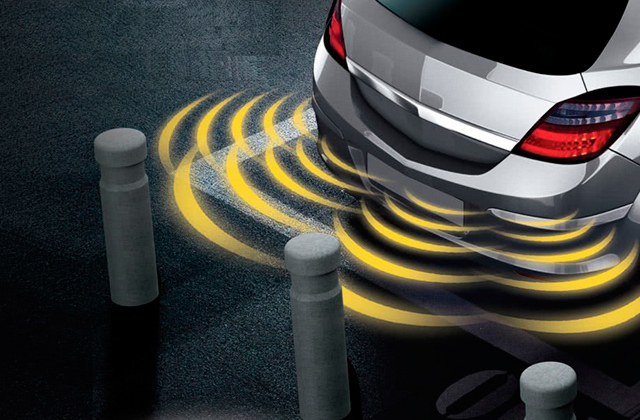 The jack moves smoothly so there's no risk of a sudden jerk destabilising the car and causing damage. The handle is too short for use under a vehicle. While it might cost a bit more than the alternatives, the Draper 39055 offers unrivalled smoothness of lift and an extra wide saddle to make sure your vehicle is in good hands. Those who value their car should bear the added cost and get this great model. The reinforced body prevents damage to the jack even if you always use it with max load. The release valve is placed too close to the oil filler. If build quality is key for you, this model from Silverline is a great choice. It's not only reinforced but also boasts a broad lifting range, making it one of the more multipurpose models on the market. The product comes with a hard plastic case that makes transportation easier. You can even fit the jack into the trunk of your car. The paint fades and chips as time goes by. While it's not the most powerful, this Hilka model boasts pretty solid lifting range and build quality. 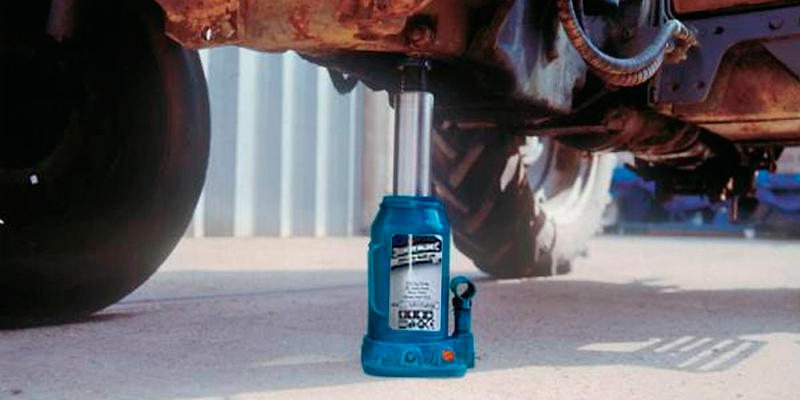 This is a reliable mini-sized jack that makes up in portability for what it lacks in load capacity. 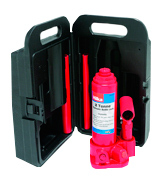 The welded body and double reinforcements in the pump prevent oil leaks. Some users report that the lifting saddle is just a bit too small. 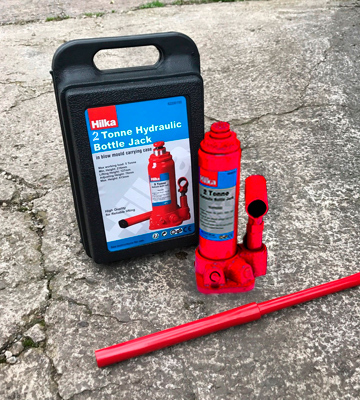 A lightweight jack filled with special oil that allows for using it even when it's freezing outside, the Monzana DBWH006 is a great choice for both your garage and emergency repairs on the road. While it's not the steadiest out there, it'll do just fine if used carefully. 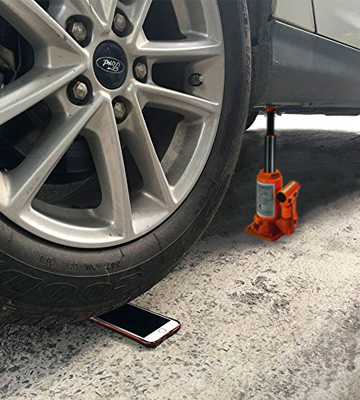 The big square base guarantees nearly perfect stability regardless of the surface the jack is standing on. The lifting range is relatively modest. 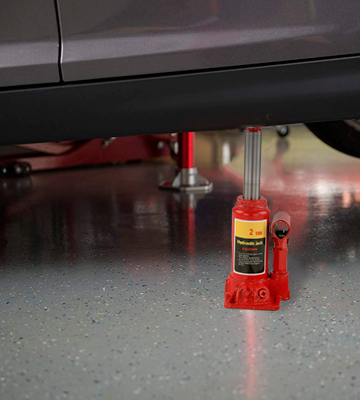 A lightweight and affordable jack that's convenient to use and store, this model is a great pick for a home garage. 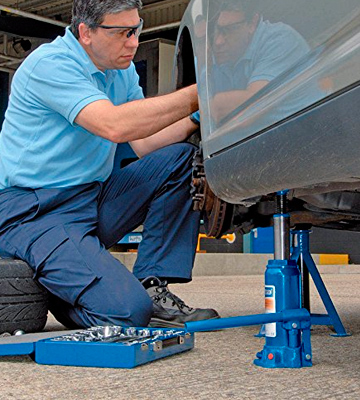 While its modest lifting range makes it less viable for professionals, any amateur motorist will surely love this reliable tool. Working on your metallic steed in the garage is always nice, especially when things are going smoothly. 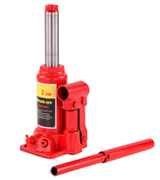 But a low quality telescopic jack can mess things up fast by simply jerking upwards too fast and damaging the vehicle. So we recommend paying a bit extra and getting the reliable Draper 39055. 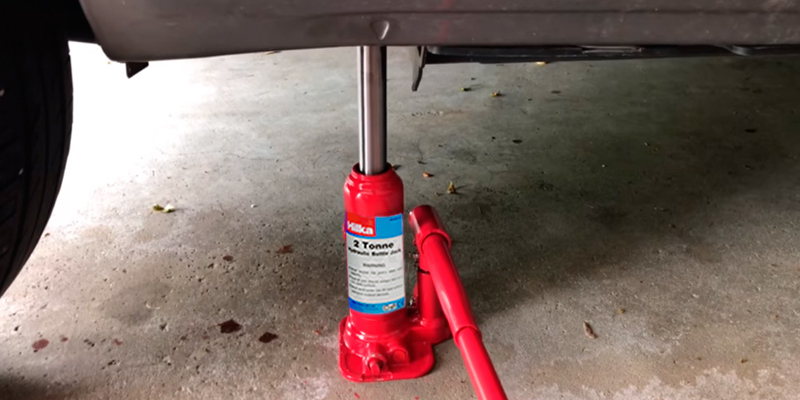 This jack moves as smooth as possible and its notched lifting saddle is extra-large to make sure it doesn’t slide or slip out from underneath the car. Although it has pretty high lift range from 194 to 372 mm, the Draper 39055 manages to keep its load steady. Speaking of which, this model supports up to 4 tonnes, nothing to sneeze at. If you do accidentally put a bit more onto it, the overload protection system kicks in to prevent any issues. Though we’ve been praising the design, we still have to note its flaws. 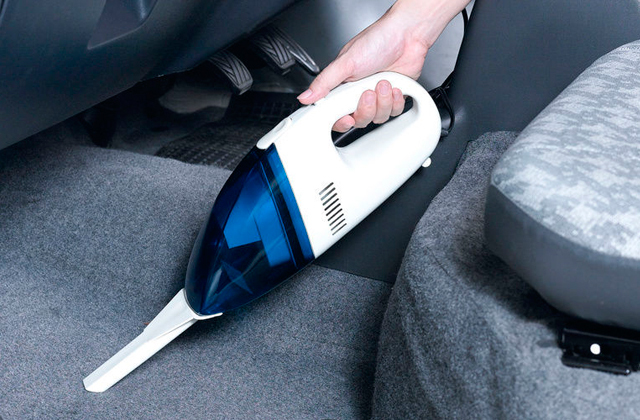 For example, the handle on the Draper 39055 is clearly not long enough to use comfortably under a vehicle. It’s strange as the model is pretty well-made otherwise and a little extension could save a lot of trouble with the handle. Still, a minor flaw shouldn’t deter you from trusting the Draper 39055 in your garage. 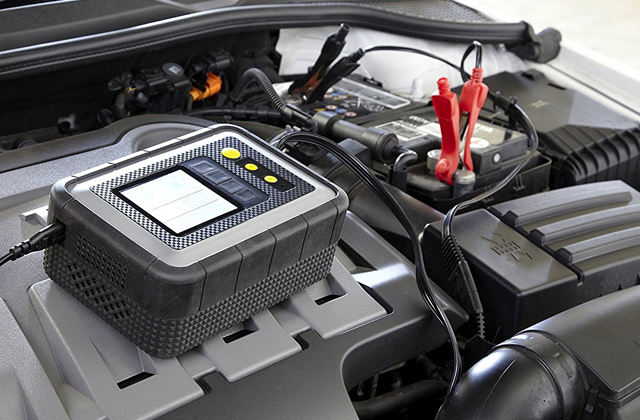 It’s a quality tool for any mechanic, professional and amateur, and it’s worth the higher than average price. A good mechanic always double checks the max load capabilities of his tools, especially if it’s something as vital as a bottle jack. 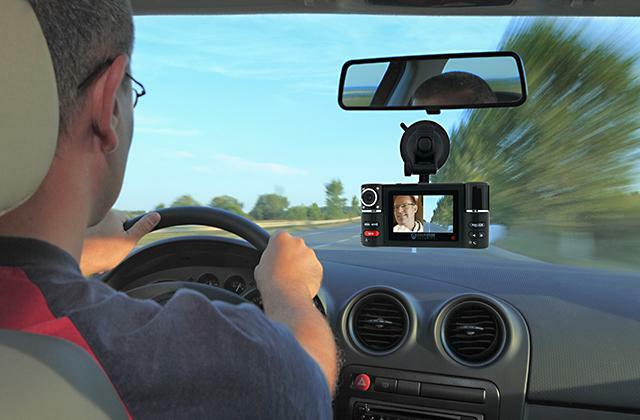 These devices should be as sturdy as they come and a bit of extra protection never hurts. 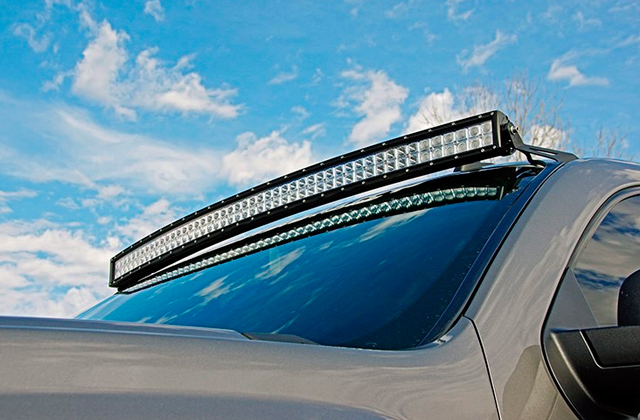 Which is why we recommend the Silverline 457050 for any car lover. This model is reinforced and heat-treated in the spots that usually bear the bulk of the weight during lifting. 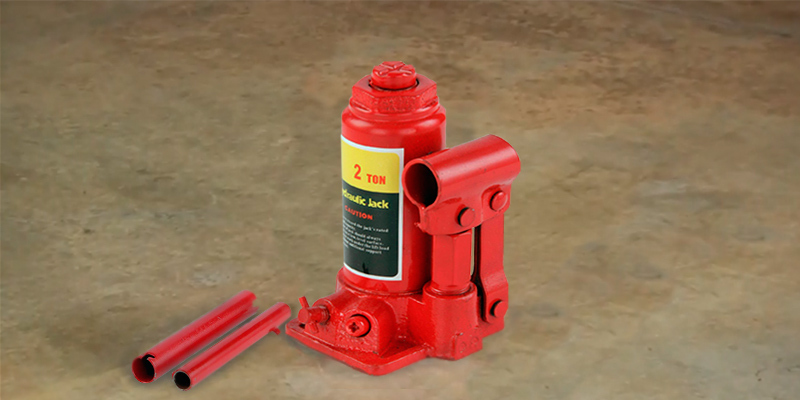 That, in turn, prevents the jack itself from getting deformed or damaged even if you use it daily with max load. And the capacity here is pretty high indeed with up to 6 tonnes supported. This alone would make the Silverline 457050 a good choice for owners of larger cars, not to mention its fortified body. Though you’ll have to lift the load manually via the handle, it’s placed pretty conveniently and shouldn’t cause any issues in terms of ergonomics. The release valve, though, is another matter, as it’s placed right by the oil filler. Expect to get your hands dirty any time you reach for that valve. In the end, we feel that the long lift range and fortified body make the Silverline 457050 a good choice for any garage. 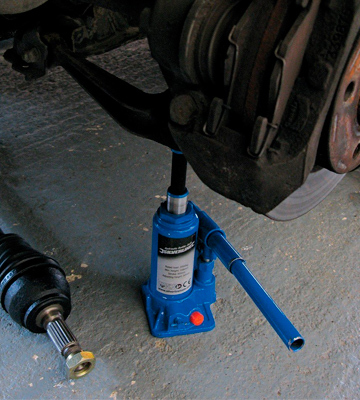 Although it’s suited best for cars with a medium and low profile, this jack is something every motorist will want in their arsenal. If you want a tool that you can take on the road with you or store comfortably when it’s not in use, you shouldn’t pass up the Hilka 82200120. This model comes with a hard plastic case that makes it much easier to transport the device or keep it in your garage when you’re not operating it. 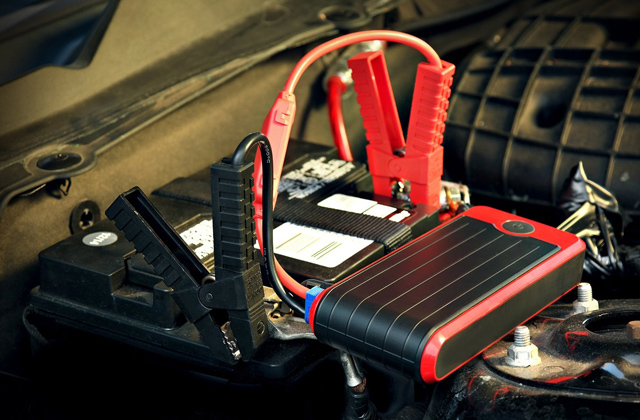 Plus, the jack and the case are pretty small and will fit easily into the trunk of your car. Although it may not be the biggest or heaviest out there at just 2.63 kg, the Hilka 82200120 offers pretty solid lift range from 181 to 345 mm. 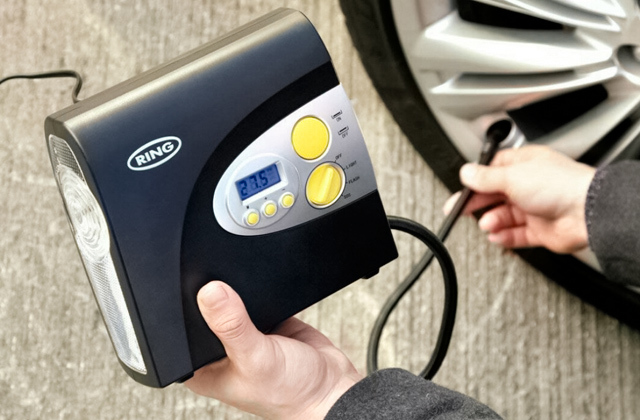 While it does, indeed, have a pretty modest load capacity of 2 tonnes, it should be enough for emergency repairs on the road or quick checkups at home. And even though we choose tools for their technical specs and not their appearance, we do regret to report that the Hilka 82200120 sports a pretty poor paint job. The colour starts to fade with time and while it wouldn’t be too important most of the time, there is a reason for concern here. The paint is supposed to protect the jack from corrosion, so when it does fade, consider getting it repainted or risk damage to the tool. Still, it’s an affordable and portable mini bottle jack that you can rely on even when you’re far from your garage and regular toolset. So a flawed design shouldn’t deter you from getting the Hilka 82200120 and using it for emergency maintenance and repairs. Tools should be easy to handle and reliable in terms of build quality, or at least that’s what we believe. If you agree, you’ll probably like the Monzana DBWH006. This jack might not boast the highest load capacity or the broadest lifting range but it makes up for it with sturdiness and smart design. For one, the Monzana DBWH006 is extremely lightweight at just 2.5 kg and thus easy to transport and adjust with one hand while you’re holding other tools. 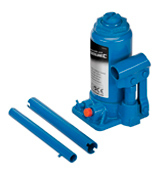 Despite the low weight, the jack is quite sturdy with double reinforcement in the pump that prevents oil leaks. Speaking of oil, the manufacturer filled this model with a special formula that stays effective even in extreme temperatures, so you can use this to work on your car even if it breaks down in the middle of the road in the dead of winter. 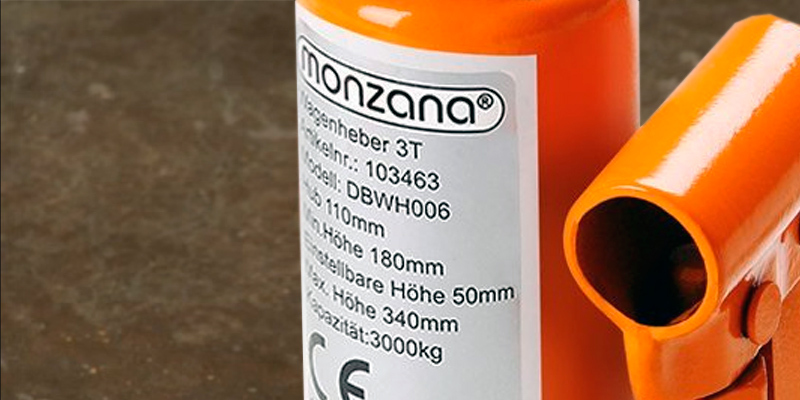 Though it may be small, the Monzana DBWH006 has pretty good load capacity at 3 tonnes. We do recommend being careful with the weight as the lifting saddle isn’t the widest out there and you should lift the jack carefully. Thankfully, that’s easy to do with the lifting handle that you control manually. All in all, while we do see some design flaws in the Monzana DBWH006, it’s still a useful and well-made tool that won’t let you down while you work on your steel steed. The fact that it can operate in any weather is a big bonus for those who often drive in the snow. A trusty tool for any time of the year. Love working on your steel steed but hate lugging around heavy car parts and tools? If you said yes, we’ve got a bottle jack that’s going to make your life just a tad easier. We’re, of course, talking about the MultiWare Heavy Duty. 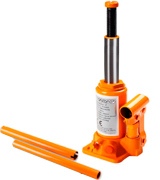 Though it weighs just 2.1 kg, this model has a large square base that guarantees stability even if you pile the maximum 2-tonne load onto the jack. 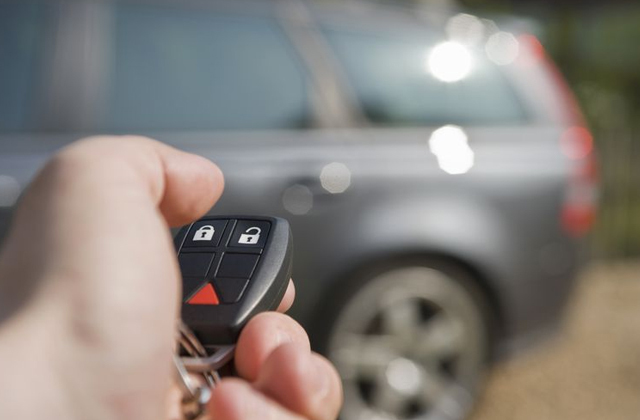 In fact, the manual handle lifting is steady enough that you won’t experience any wobbling or skidding, two main reasons for damage to cars during would-be repairs. 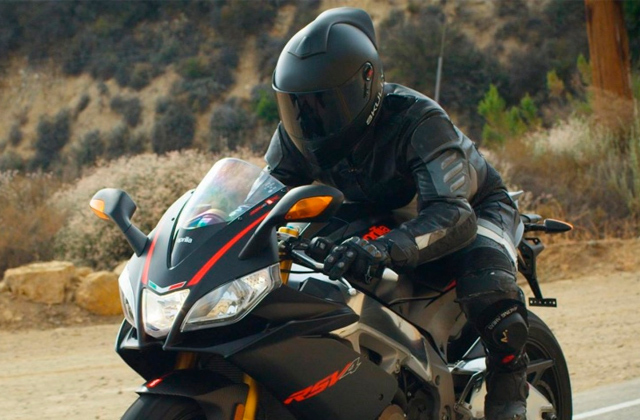 The saddle is also wide enough to support your car without any unwanted movement. We do have to concede that no tool is perfect and if there’s any area in which the MultiWare Heavy Duty could use a bit of improvement, it’s the lifting range. While it’s not exactly poor, it’s a bit less broad than what you get in bigger jacks. But it should be enough for any minor repairs you choose to do in your garage and the MultiWare Heavy Duty a budget-friendly model, which makes this less of a problem. But that’s just a minor gripe against a very solid tool. Even though it’s lightweight, the MultiWare Heavy Duty stands its ground against devices twice its size. So if you want a tool that’s easy to work with, this is the option for you. Sometimes vehicle maintenance requires tools that can lift a 20-ton car with ease, something that even the strongest man can’t do. 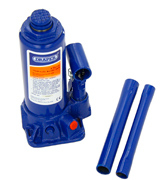 For cases like that you need a bottle jack, a pneumatic instrument that helps raise heavy objects. Most of these devices are quite similar, varying largely in terms of max load, lifting range, and some extra features. 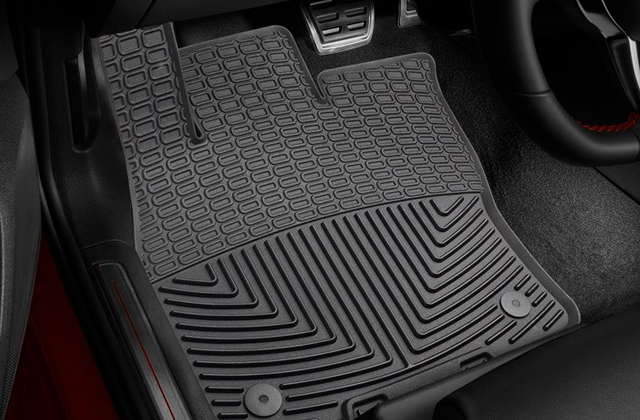 The latter may include protective functions, reinforced parts, and new control options. If we were to speak of a standard jack model, the concept is quite simple. 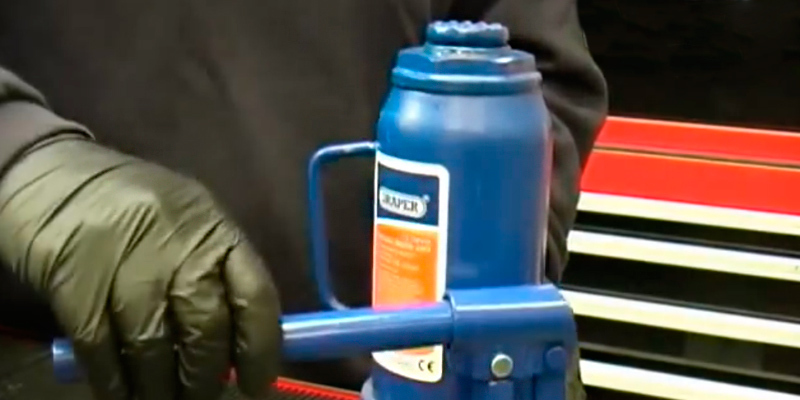 The bottle-shaped tool has a hydraulic ram that goes upwards, lifting whatever object is on top of it. Most models are controlled via a pump though some have to be geared up by hand. Although we’re mostly focusing on them as a safe car maintenance tool, professional builders sometimes use it to lift houses and other structures. So even if you don’t plan on having a lifted truck in your backyard any time soon, consider buying one of these for any future renovations you might have. 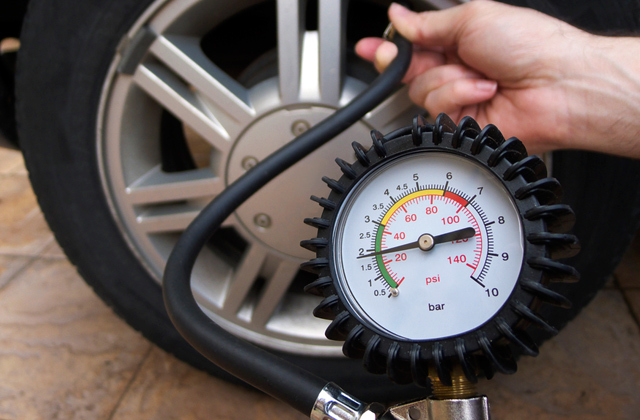 While you’re working on your car, don’t forget to use one of the trusty OBD2 scanners and check your wheels using the tire pressure gauges. 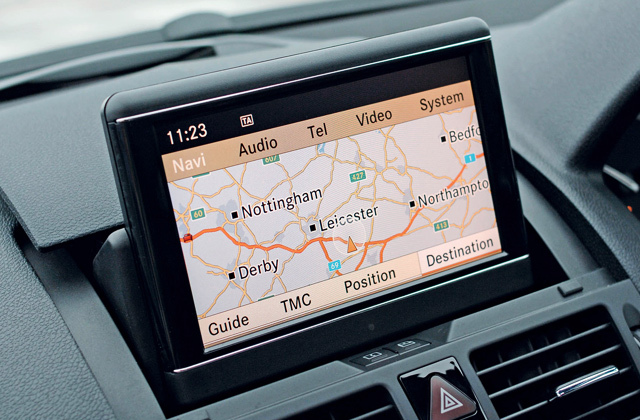 You don’t want to go out on the road in a faulty vehicle.